Vendors can rent a space (size of a parking spot) for $25, which reserves your spot to sell tag sale items, crafts, baked goods, etc. The tag sale will be advertised online and around town. Vendors keep their own profits! 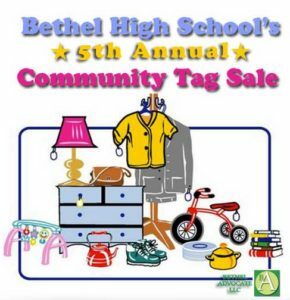 Sellers at the Community Tag Sale are responsible for all equipment, such as tables and chairs, and must take all unsold items with them at the end of the event. Vendor set-up: 7:45 a.m.-9 a.m. The Class of 2020 will be hosting our own booth with a variety of items to sell at the May 5th Community Tag Sale – so we are asking for donations from students, staff and parents. We cannot take large items, but clothes, books, CDs, frames, household items, toys, baby items, etc. are all welcome and VERY much appreciated. Please drop off your donations to Room 328 or 317 @ BHS. We will start taking items right away.